Japanese beetles can destroy the bulk of your garden crop in just days. They not only have a devastating impact on growing plants, but are extremely difficult to kill. Short of standing in your garden around the clock plucking the Japanese beetles off the pants and squishing them beneath your feet, there is no surefire way to destroy them all in one fell swoop. 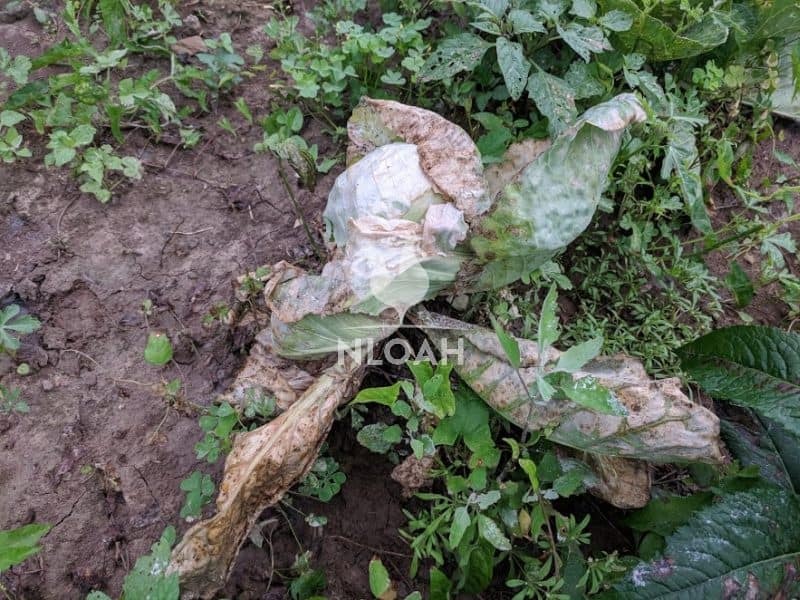 If you are diligent in your efforts, you can at least curtail the damage they inflict on the crops. 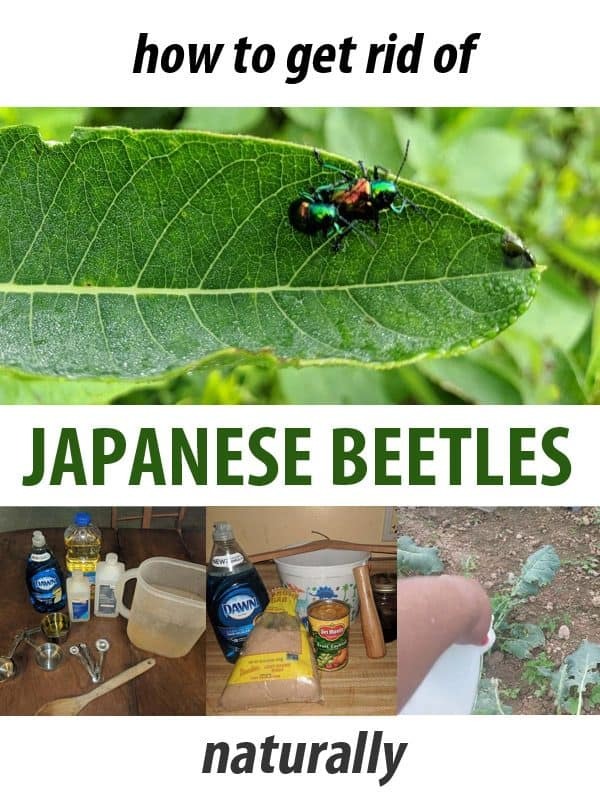 It does not take harsh chemical pesticides to get rid of Japanese beetles, odds are you have all the supplies necessary sitting on a shelf right now. These photos were taken on the following Wednesday afternoon – after the Japanese beetles moved in. 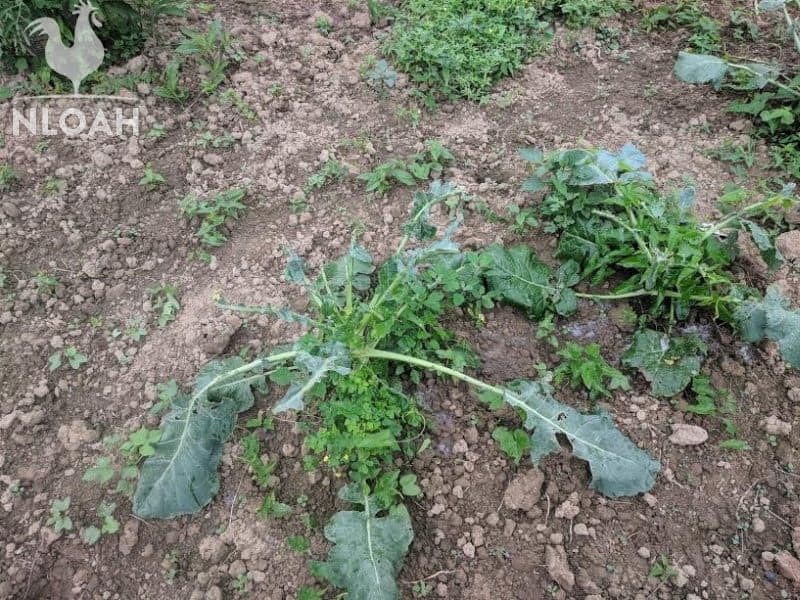 This close up image of broccoli leaves above illustrate what a plant will look like after Japanese beetles begin feeding on it. This is a far too familiar sign to homesteaders and farmers that they now have a monumental problem on their hands. We thought we had dodged a bullet with Japanese beetles this growing season due to the preventative measures taken in the spring right after putting our plants in the ground. Killing the larvae before they can mature into adults is a huge part of the battle when dealing with this beetle population. Before you can effectively deal with Japanese beetles, it is essential to learn more about how they develop and what plants they both loathe and love. The shiny green and copper colored beetles are tiny, but the threat to your growing food supply is enormous. It would be far easier to create a list of plants Japanese beetles won’t eat, than ones it will. They are listed as a threat to literally hundreds of different crops, fruit bushes, and flowers. Only a few different varieties of trees and plants will help repel them. While the beetles can be found most anywhere in the United States, their largest colonies exist in both the Midwestern and Eastern regions of the United States. It is soundly believed that Japanese beetles were introduced to America quite by accident during the early 1900s. Prior to that date the crop-devouring beetles roamed only among the Japanese islands. Because the beetles were isolated to Japan by water and their natural enemies in the natural world, their populations didn’t not rage nearly out of control. Sometime around 1912 a new law was passed in America that forbid the importation of plants that came rooted in soil. But, the government did a poor job of regulating the law and the Japanese beetles are believed to have hitched a ride to the United States on potted iris plants when they were mere grubs. Although efforts to kill off all of the Japanese beetles in America were in full swing by 1916, the government abandoned its effort to eradicate the pests by 1920. The little Japanese beetle had proven itself just too durable a foe to completely vanquish. 1. The beetles are approximately a half an inch long. 2. Their heads are a shade of green or blue-green and cast a metallic hue. 3. Mature beetles lay their eggs directly into the dirt in early June. 4. Young Japanese beetles are known as grubs. Their bodies are white, their heads are brown, and they have six legs. The young beetles are approximately three-quarters of an inch long. 5. The beetle grubs remain buried in the soil for about 10 months – over the winter, until they mature into adults and burrow up out of the soil to begin feeding. 6. 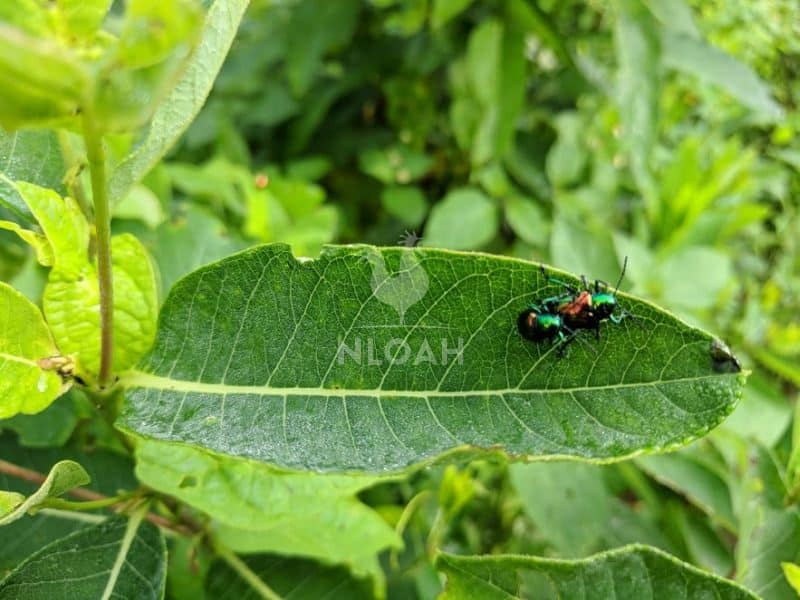 Japanese beetles almost always feed in small groups, meaning a host of them will attack a single plant together – the primary reason why an infestation becomes severe in an especially short amount of time. 7. The average life cycle of a Japanese beetle is roughly 40 days. 8. One of the few natural predators the beetles have in the United States is the yellow jacket. 9. The beetles typically start eating at the top of a plant and work their way down to the roots. 10. Japanese beetles are usually most actively eating on hot sunny days and seem to prefer eating crops that grow in full sun. Geraniums are a favorite snack for the beetles. Cultivate a border around your growing areas using geraniums to entice the destructive invades to munch on the plants instead of your thriving food crops. This is the most time consuming way to get rid of Japanese beetles, but it does work well. Invite the family and friends over to your homestead for a Japanese beetle plucking work detail – cookout. Simply walk around your garden plot or growing area and find plants that have been eaten by the beetles. As noted above, they are most active during the heat of the day. Start at one plant at the beginning of the row and look it all over, plucking all the beetles you can find from the plant. Step on the beetles and stick the dead ones in a sack to hang a stake near the row. Puncture a few holes in the sack to the smell of decomposing beetles can be sniffed by other members of their colony. Typically, the beetles will not enter an area that smells like their dead unless they are starving – an old farmer shared this tidbit of information with me and it seems to work at least somewhat. 1. 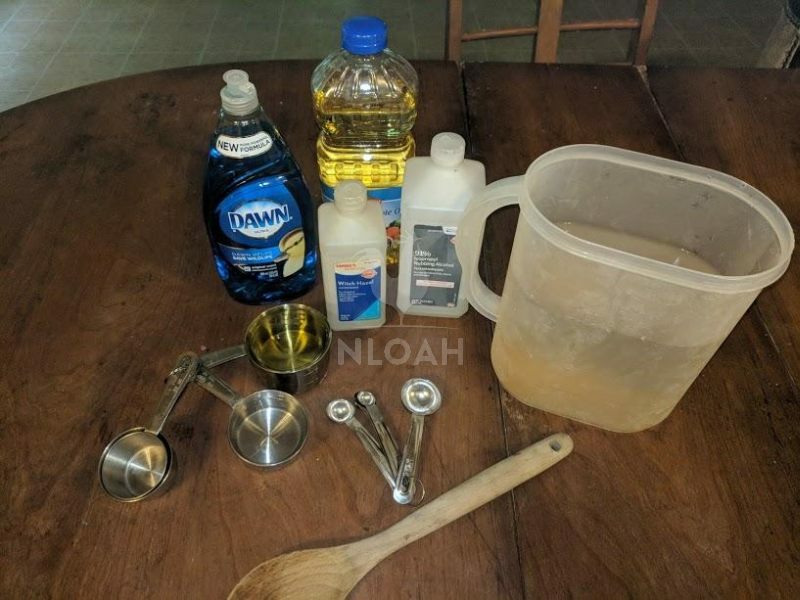 Mix together 1 cup of vegetable oil (carrier oil like olive oil works well too) with 1 cup of dishwashing soap (Blue Dawn seems to work best) 1 cup of rubbing alcohol, and 2 quarts of water. 2. Pour the mixture into a jug with a firm-fitting lid or an agricultural sprayer. 4. Spray or pour onto the plant once every 5 to 7 days. Apply the mixture during the morning hours when dew is still on the plants and not during the heat of the day to prevent scorching. 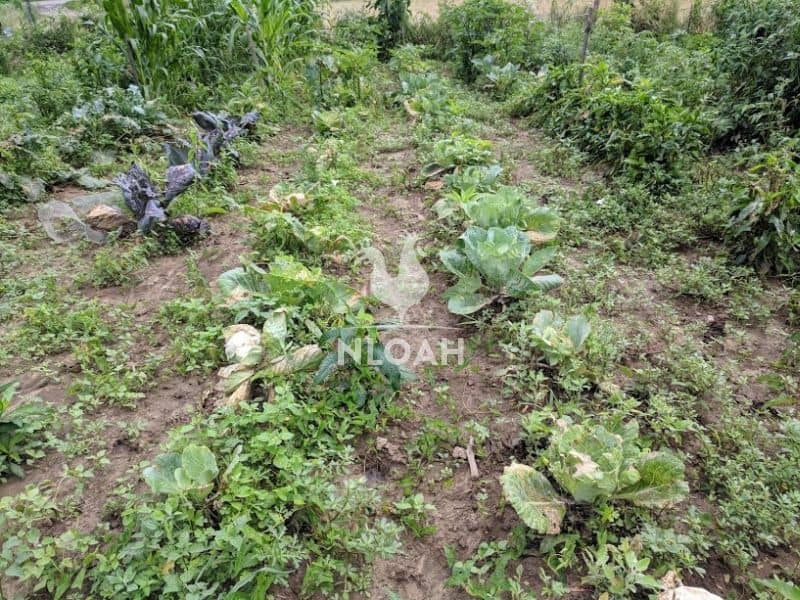 If the crops show signs of wilting after the sun has been out for a few hours, rinse the plant with lukewarm water and tone down the rubbing alcohol in the next batch. 1. Mix together up to 1 tablespoon of mineral oil and 1 garlic bulb or up to 1 tablespoon of garlic powder. If using fresh garlic, allow the mixture to soak overnight and strain the garlic before moving on to step 2. 2. Fill a jug with 2 cups of water and add in 1 tablespoon of Blue Dawn – or your favorite liquid dish soap. 3. Combine both mixture into an agricultural sprayer or jug with a firm-fitting lid. Holes can be poked into the lid of the jug so it can become a delivery method for the “spray” so you can sprinkle it over the plants. 4. Spray or shake the natural insecticide directly onto the entire plant during the morning hours. 5. This spray should work well to deter not only Japanese beetles but also cabbage loopers, June bugs, aphids, earwigs, whiteflies, squash bugs, and leafhoppers. 6. Apply once or twice a week – or as necessary. Mix together 2 cups of flour and 1 cup of salt (standard table salt works fine) and sprinkle it liberally onto plants. As with the sprays above, do the powder sprinkling during the morning hours. 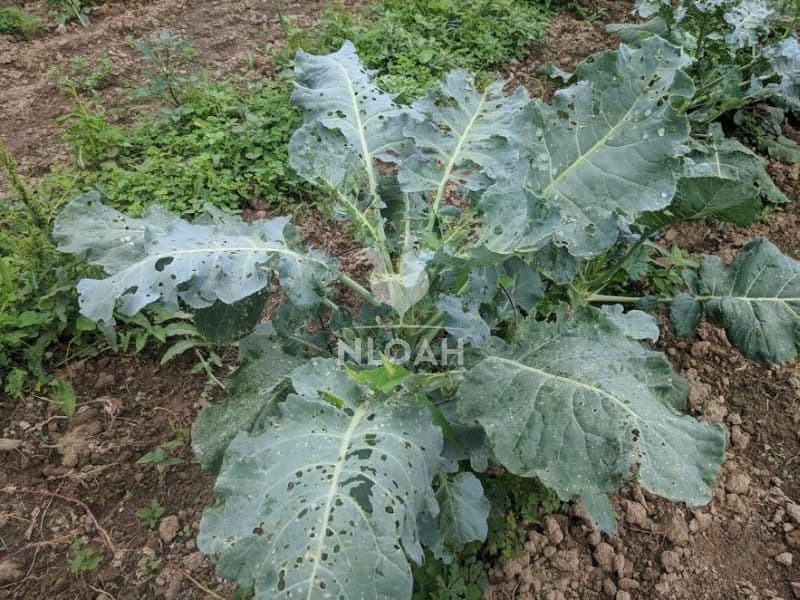 The Japanese beetles, cabbage loopers, and other insects will consumer the flour and salt mixture and then their stomachs will bloat until they burst, killing the garden pests. These cabbage photos above show what happens when you use the flour and salt mixture when it is too hot and humid. Even though I followed the strong recommendation to apply the salt and flour herbicide during the early morning hours when there is still dew on them to allow it to soak in and avoid scorching, the plants still got scorched. I also applied the mixture before it was 85 degrees, as recommended. Because we are in the midst of a heat wave, it hits 5 degrees early, usually before 9 a.m. The beetles were killing the plants, so the risk of scorching them was one I was willing to take. I reduce the amount of salt to help prevent a negative outcome, but as you can clearly see, scorching occurred just the same. The plants do not appear to have died, only time will tell if they will produce anything or not. But, the liquid sprays I used in the videos as well as the flour and salt mixture, have kept the Japanese beetles and other bugs away. I have only seen beetles on two tomato plants I did not put any treatment on – using them as a kind of control group. During the spring, spray the garden area with a mixture of 1 gallon of water and 2 tablespoons of liquid dishwashing soap – Blue Dawn highly recommended. If the ground is not too hard or dry, the grubs buried slightly below the surface will rise above ground and be eaten by birds. This recipe should yield enough spray to cover 2,000 square feet. If you have had significant Japanese beetle issues in the past, spray this mixture once a week in the spring and again in the late fall before winter sets in to kill as many grubs as possible. Purchase milky spores (a fungal disease sponge-like garden product) to kill the larvae of Japanese beetles. The young beetles consume the spores as they grow under the ground. This method of killing a mature colony before it starts works well, but it generally takes up to three years before the milky spore content in the ground will be strong enough to kill the larvae that ingest it. Once the milky spore count peaks, it should remain in the soil at a potent enough rate to kill beetle larvae for two years. The other drawback to this Japanese beetle eradication project involves cost. Milky spores are far more expensive than the other natural insecticide ingredients and this list and it takes a whole bunch of them to treat a typical garden area. 1. Open up a can of fruit cocktail, canned fruit, or pick/purchase fresh fruit and place it outdoors in a sunny spot until it ferments – becomes somewhat rancid. If you are using canned fruit cocktail or fruit, this process may take up to 7 days. 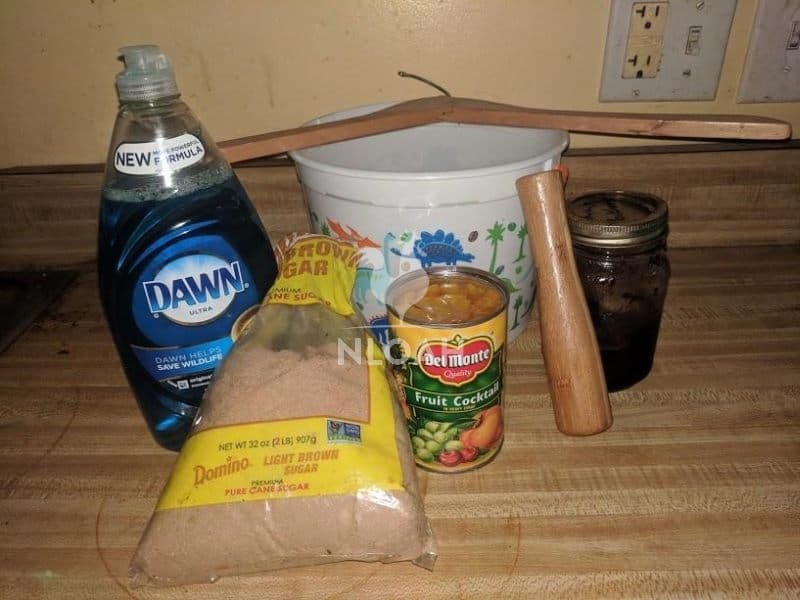 You can also add in jelly, jam, vanilla extract, or brown sugar to help make the bait for the trap both thicker and more sweet. 2. Pour a few tablespoons of Blue Dawn (or other liquid dish soap) into a bucket. 3. Place a board or something equally heavy onto the top of the bucket. 4. Mark the space where the board lays over the center of the bucket. 5. Slather the fruit and sweet mixture on only the bottom side of the board so the Japanese beetles (and other pests, especially yellow jackets) have to maneuver upside down and remain in that position while they gorge on the bait. 6. The beetles will become heavy, tired, and have difficulty with both their sense of balance and direction as they attempt to leave the rancid fruit buffet. 7. The loss of balance and sense of direction should cause the Japanese beetles to fall to their deaths in the water waiting below. 8. The water level in the bucket should be no more than 1 inch below the bait. 9. Place the trap about 10 feet from crops where Japanese beetles are prone to visiting or have already set up housekeeping. You want to draw them away from your crops rows and not towards them. Usually, younger the beetle, the more effective this trap is in killing them. The dish soap is added to the water to make it more permeable and prevent the Japanese beetles and other crawling or flying insects, to save themselves from drowning. This trap will also attract yellow jackets, who will likely kill at least some of the beetles while visiting the trap. This natural and inexpensive Japanese beetle and garden pest control opton is comprised of fossilized seashells.The miniscule yet highly sharp fragments in the diatomaceous earth will puncture the bodies of beetles (and most all other garden pests) both internally and externally as well as provoke deadly dehydration to occur. Simply sprinkle the diatomaceous earth (DE) around (not on) the the plant and between rows so any beetles or pest that crawl or walk past it, have their bodies coated in the powder, even if they opt out of directly consuming it. 1. Mix together equal parts garlic (fresh or powder) horseradish, green onions, crushed peppercorns, and hot peppers. 2. Stir enough enough water to make a spray or broth-like consistency. 3. Pour in 1 tablespoon of Blue Dawn – or other liquid dish soap. 4. Spray onto plants during the early morning hours and between plants, for best results. 5. 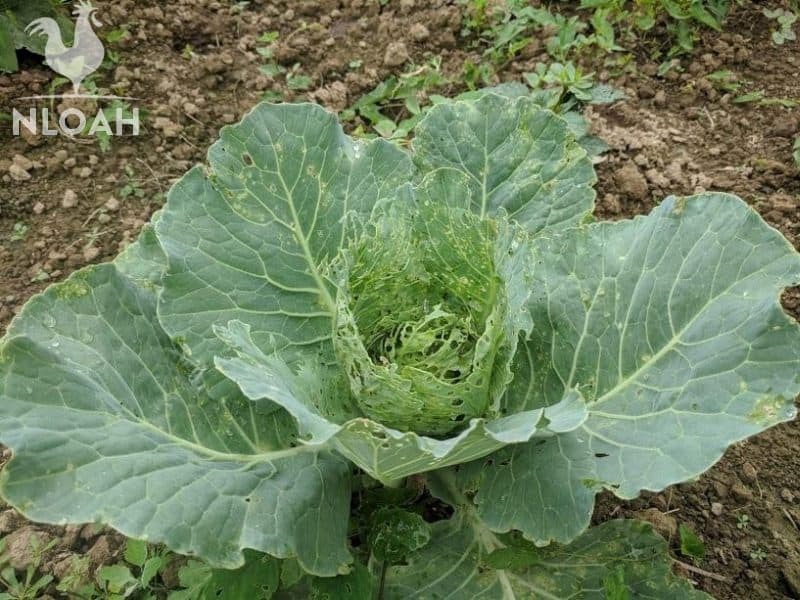 Repeat as needed, typically two applications a week are necessary to thwart Japanese beetles and other determined garden pests, like the cabbage looper. Most sprays or dusting powders designed to kill Japanese beetles and other common garden pests are also extremely toxic to the incredibly beneficial honeybee. To reduce honeybee carnage as much as possible, apply the sprays and dusting powders only when essential and not during the spring blooming period when visits by honeybees are most crucial. Thank you for all the tips! We lost all our apples last year due to Japanese beetles – the apples rotted on the tree. There’s a huge infestation again this year. We tried setting pheromone traps but have since read that they can make things worse by drawing the beetles into your area. I want to give your sprays a try. I hope my sprays work for you and your husband as well as they worked for me. Those beetles sure can kill a potential harvest quickly. I love that you have freezer bags full of bugs, how clever! 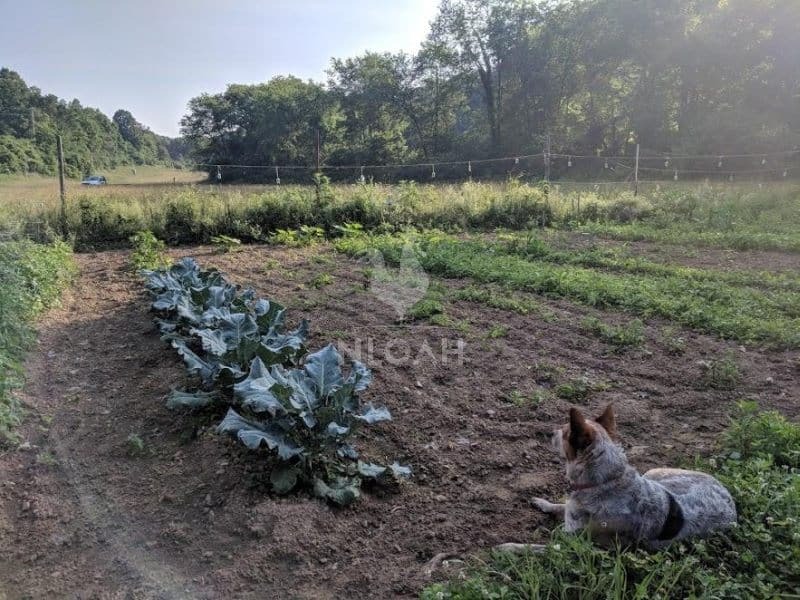 Chickens do love them so you are providing a great source of natural protein to their diet without costing you a dime – and getting some great revenge on those dang Japanese beetles in the process! !